Turning a a year older is not easy. It’s a dreaded landmark, especially if you've lived most of your life with bad skin. Maybe it’s nature’s way to say that the good days lie ahead but you truly would not believe it if you've lived your teens and part of your 20’s with a healthy mix of breakouts, spots and acne. All through my teens I was in pain, from the terrible thought of being ugly just because pimples never left me. All my friends always tried to cheer me up with the “You've got a new boyfriend” tease. But it never made me feel better. I always wound up feeling conscious and unattractive. Not that I didn't try anything. Whenever I tried something new I was left disappointed. No sooner one pimple would seem to subside to a disgusting rash; another one would pop up immediately. My face was a visible proof of not only skin deterioration but also of my weakening confidence. Pimples don’t only affect the skin, they affect a life. People may say, ‘It’s just a pimple, no great deal’ but only those who have suffered through this, actually realize that these tiny monsters takes away from a personal socially, physically as well as emotionally. As life progressed in the company of pimples, my anxiety gave rise to depression that finally led me to withdrawal from everything. I stayed put in my room, didn't venture out unless necessary and made makeshift walls all around me. As typical of people they offered expert suggestions to treat my condition. And trust me I did try everything, almost up to changing my lifestyle but nothing helped. I was ready to settle with the fact that this was an incurable and permanent condition when a friend’s mother suggested I try Neem Neutralising. I debated and then gave myself another chance. ‘What’s the harm in trying’ I asked myself. And I guess it was the best debate I lost with myself. I used Neem Leaves into my daily routine in more ways than one…. Boil neem leaves in a cup of water and use it to regularly to wipe your face with to help reduce breakouts and clear the acne marks. This magical water works as a toner to leave you skin supple and clear when used regularly. Grind in a little bit of sandalwood, tulsi leaves and neem leaves to make a face pack. Apply the paste evenly on your face, let it dry for about 15 minutes and then rinse it off with cool water. Add neem juice to drop of olive or almond oil and a water to apply all you’re your face and neck. This works as a moisturiser as well as a primer thereby reducing pigmentation. This trick also helps to get rid of dark circles. Over a period I actively took interest in treating my skin with these amazing tricks and I could see a change. A Happy Change! 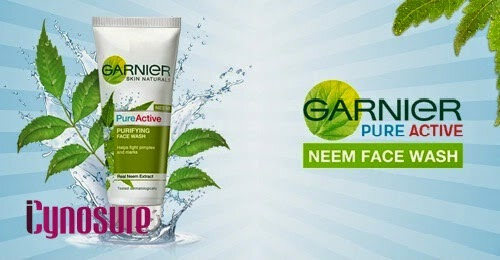 And after all these years of a systematically set Neem routine, I chanced upon the skincare range by Garnier Skin Naturals and instantly fell in love with Pure Active Neem Face Wash.
And I tried the face wash… The Pure Active Neem face wash is truly a gem with extracts of neem leaf and tea tree oil extracts. 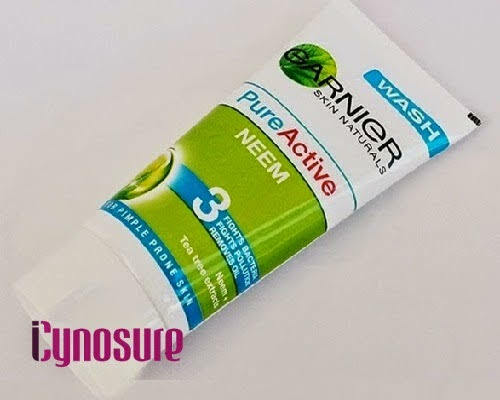 It prevents pimples and breakouts along with removing black and white heads. 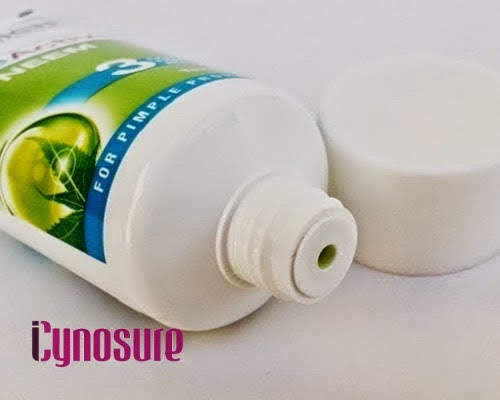 It works excellently on combination skin type; reducing irritation and oiliness. Surprisingly a little quantity lathers enough to clean the face thoroughly; exfoliating and neutralising the overall skin tone. It does hydrate the skin simultaneously while cleansing it but sometimes it does feel a bit dry and stretchy. With the price and travel friendly packaging, the product is a winner. All in all my confidence has been restored and I love looking at myself in the mirror. The girl in there even when bare-faced feels beautiful. Have you tried any neem products?